Another day, another Nexus leak. This time around we're treated to what is purported to be the first leaked image showing the LG Nexus 5X in black. 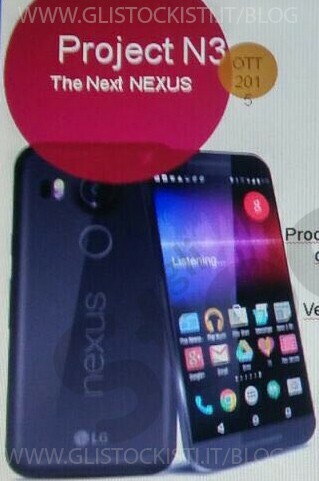 This reportedly is a shot of an internal slide from the Korean company, and it reveals that the codename for the new Nexus by LG was Project N3. That kind of makes sense, since this would be the third Nexus that LG's made. As with the pictures of the white model, the fingerprint sensor is in the same location underneath the camera, while the LED flash and the laser autofocus are both on the same side of it. Alongside this shot, we also get another round of rumored specs for the Nexus 5X. It's said to come with a 5.2-inch 1080p touchscreen, a 12.3 MP rear camera, a 5 MP selfie snapper, Qualcomm's Snapdragon 808 chipset at the helm (with a hexa-core CPU), 2GB of RAM, 32 or 64GB of storage, and a 2,700 mAh battery. Support for LTE Cat.6 will be built-in apparently, which means maximum theoretical download speeds of 300Mbps, and 50Mbps uploads. The software will obviously be Android 6.0 Marshmallow, as the Nexus 5X will be one of the two handsets that version will debut on (with the much talked about Huawei Nexus phablet being the other). The two devices are expected to become official on September 29 at a special event, though Google hasn't sent out any invites yet. Of course you should have had a grain of salt nearby for this, as it's nothing but a rumor. However, it's one that corroborates the design of the phone that was leaked before as well as most of the specs. 12.3 mp camera? Seriously ? Somebody tell those Lg and Nexus people that we are in 2015. Every time they come up with a nexus phone there is something missing!